Ok this post is coming a little late.. but "better-late-than-never!" Wanted to do a group shot of all the AC3 items that I got over the last 1-2 months, actually more of the items that I intend to keep as I sold a few extras and some which I didn't feel would fit into my collection. And the remaining items are..
Hopefully I didn't miss out anything as most of the stuff are all over the place. Sure, they are plenty of other collections out there which are bigger and more extensive but I'm very happy with the ones I have and I don't think I have a strong need for most of the others. So let's talk about the stuff in the pic.. The 2 Connor figures were definitely the ones I was most looking forward to. Very detailed and well-painted, they fit really well with the previous Assassin figures. But the spotlight will definitely be Connor's Tomahawk replica which is a more realistic version of the retail one for sale. This model was only given to members of the press and employees of Ubisoft. I was told only 300 were made so it's definitely a very treasured piece of my collection. It's a huge plus that it comes in a very cool Wooden display box. Very very nice! Connor's Medallion is also very cool as well as a replica of the Declaration of Independence Letter. The Letter replica was given to me for free so I will be treasuring that as well. Might want to frame it up sometime in the future. The Encyclopaedia (2nd Edition) will definitely be a good read for more info on the Assassin's Creed Universe together with the Novel and George Washington's Journal. The Collectors' Edition guidebook is another addition to my growing CE guidebooks from Ubisoft. The Lithographs are also really cool even though I won't buy them separately. They will be fighting for space in my new place. Most of the stuff came from the various CEs that I purchased. It's been a fun few months pre-ordering all these and waiting impatiently, err I mean, patiently for them to arrive. Receiving package after package from around the world has been exciting. 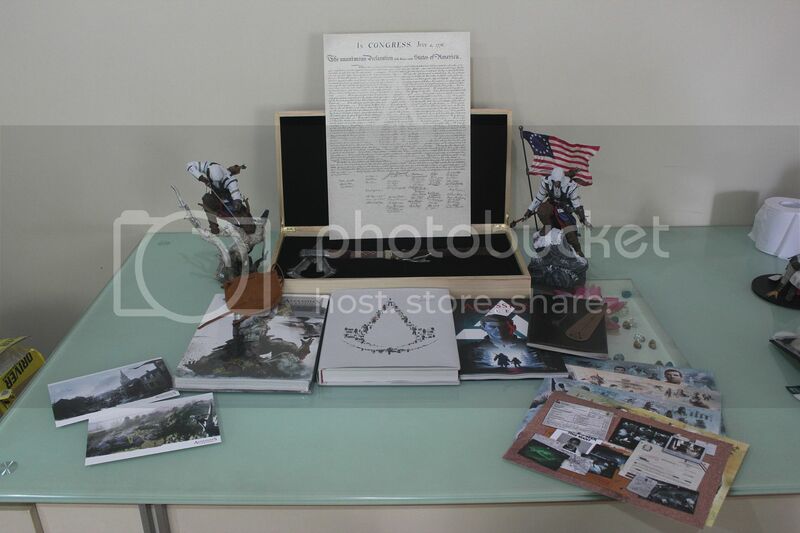 Got to know a couple of other Assassin's Creed collectors around the globe as well. I don't believe I have had this much fun, on a collecting level, with a single game before. Sure, we complain about the number of CEs and merchandise they bring out, but at the end of it all, the collection looks awesome! It's been an exhilarating experience and I will be looking forward to the next Assassin's Creed. Bring on the Collectibles!! Oh.. and did you hear? Rumour has it that the next Assassin's Creed will be in Brazil..